Still trying to free-hand those corner radius on your projects? With this template set you can cut a perfect radius with your router table and flush trim bits. 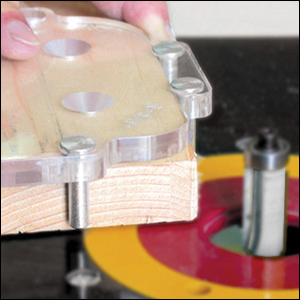 The 3 templates cover radius sizes from 1/8" to 1" in 1/16" increments, while the clear acrylic plates allows you to see exactly what you are doing. Also, the adjustable and moveable steel index pins align the template exactly on your project and stabilize the template on your work piece for safe cutting of the stock. Double Sided Tape works for fastening jig to your stock.